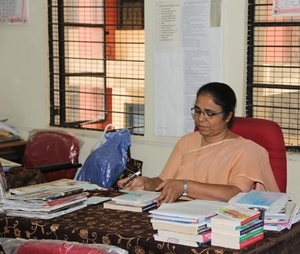 The Jyoti Nivas College Library and Information Science is the lifeblood of the institution. It is the nerve centre of the college that provides the students, teachers and the research scholars with the tools for the acquisition and advancement of knowledge. The JNC Library was established in the year 1966 in Frazer Town. In 1976 the college shifted to Koramangala. The Library was first housed in a small room. Later it was shifted to a large hall where it gradually developed into a big library, with a collection of around 30,000 books and 75 Periodicals and Journals. As the college began to grow and develop there was a shortage of space to store library materials and also to accommodate students and staff. A strong need was felt for a bigger building to house the library. Consequently in the year 2000 the present building was constructed which comprises of a basement and four floors. Jyoti Nivas College has made vast improvements in the field of library and information services to the users. Second Floor : Natural Sciences, Mathematics and Applied Sciences and MCA. The library is spacious and well ventilated. The overall purpose of the library and information centre is to support the curriculum offered at the Jyoti Nivas College. The function of the library is to support and enrich classroom instruction through a collection of carefully selected material based on courses and programs offered by the college. The library is a multimedia information service centre. It has a carefully selected and a growing collection of more than 80,000 books and subscriptions to around 154 current periodicals and journals and variety of non-print information sources. Non-print format including videos, slides, CD-ROM databases and computer based technologies are available to provide a wide range of information for library patrons. Library patrons are encouraged to use the library for study, research, browsing and self-improvement. Professional staff is on duty to assist with reference, research and reading guidance. The staff provides assistance in the use of the information centre and its resources. The library remains open on all working days except on national and Gazetted holidays. Every department can borrow few books for ready reference. Only those books, which have more than one copy, can be issued to the Department against the signature of the departmental head. If a single copy is available, it will be kept in reference section only. All the departmental books would be available in the department for ready reference. A proper record will have to be kept by the department for these books and the department will be responsible for them. The library issues the books of SC/ST Book Bank to the SC/ST Students only. This service is without any charges. The student is Required to produce the SC/ST certificate for availing of this facility. Identity Card is compulsory for getting access to the library services for Faculties and Students. Borrowed books should be returned on the exact due date failing by which a fine of Rs.2/per day would be charged. Renewals are allowed only once on the exact due date and when there are no claims by others. Loss of borrowed books have to be reported immediately in writing to the librarian and replace the same. Reference Books, Periodicals & Project reports will be available for reference only. A borrowed book, if recalled by the librarian has to be returned Immediately. Reprography services available at a nominal charge.